My friend Dennis let out a loud “yahoo!” and we all stared at the sky. We were on our way to our vehicles after a festive gathering on a frosty October night in the Yukon, when the sky began to light up. Earlier our conversation had centred on the fact that winter was coming quickly and there was still a lot to be done to prepare for it – a house to finish, wood to be cut and stacked, food to be gathered. But in that moment all our concerns faded away as we stood beneath the northern lights with our heads lifted, our mouths open and our spirits in awe of what we were seeing. Huge swaths of coloured light shot across the sky. When Dennis hooted the light seemed to dart toward us. Then it swooped sideways in a shower of vibrant greens and blues. As we stood in silence the aurora dipped so low we could hear its electric crackle. 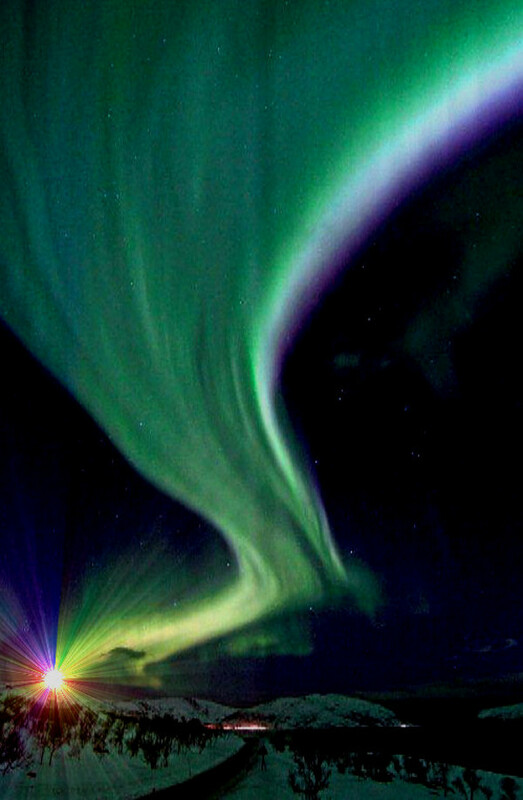 Every time I have seen the aurora borealis I feel as though I have stepped back in time, to the earth’s beginnings. Every time I have seen them I am aware that what I know about this planet, this solar system, this universe, can be contained in a thimble. Scientists are still discovering new things about the planets, stars, asteroids and other things out there. Bigger and better telescopes have helped them see that the solar system is far more extensive than was once thought. The extent of it staggers the mind. Just the extent of our own galaxy is almost beyond what we can imagine. Scientists now say it is impossible to even design a scale model of it that would fit inside a massive building. And think of this – if the sun were a bowling ball with a diameter of 8 inches, Jupiter would be a chestnut, Neptune a coffee bean; the earth would be a peppercorn with a diameter of .08 of an inch. Are you feeling small yet? That’s how those northern lights make me feel – small and rather vulnerable. They also make me realize that what I know about the creator of this universe would likely fit in an even smaller thimble. I am in sync with the Psalmist who wrote – “When I consider your heavens, the work of your fingers, the moon and the stars, which you have set in place, what is mankind that you are mindful of them, human beings that you care for them?” (Psalm 8:3,4). Yet He does care, He is mindful of us. Psalm 8 continues – “You made them rulers over the works of your hands; you put everything under their feet; all flocks and herds, and the animals of the wild, the birds in the sky and the fish in the sea, all that swim the paths of the seas. Lord our Lord, how majestic is your name in all the earth! (Psalm 8:6-9). I have never seen the northern lights or aurora….but would love to someday 🙂 Thanks for your wonderful description of His mighty works in the sky.